Featuring a water-cooled V-twin engine tuned for muscular torque and effortless pulling power, the Brute Force 650 4x4i delivers legendary performance and value. The soft riding is due to the Fully Independent Suspension, which is able to cope with comfort. 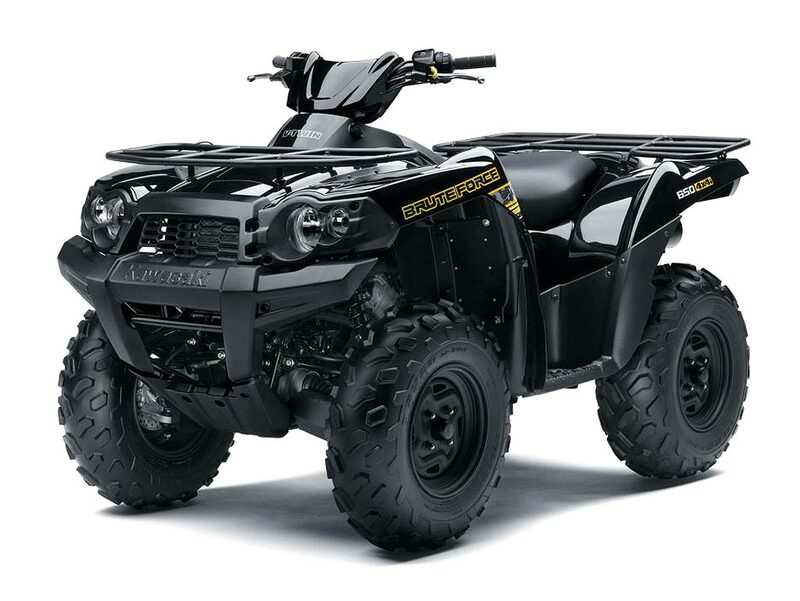 An ATV with Maximum Strength and Maneuverability - This highly capable ATV provides superior V-twin power, sound and smoothness, plus a strong 4-wheel-drive chassis and four wheel independent suspension to deliver an unbeatable combination of performance, handling and value. The Brute Force® 650 4x4i ATV is a superior choice in the middleweight category. Its 90-degree four-stroke V-twin engine produces impressive low-to-mid range torque, plus enough high rpm power to make any demand. A fully automatic, dual-range continuously variable transmission delivers the power through low and high range ratios, plus reverse and neutral. Its smooth operation helps maximize traction and also reduces strain on the rider. Two- or four-wheel drive is selectable by simply pressing a handlebar-mounted button. In four-wheel drive mode, the rider can manage the amount of power to both front wheels with Kawasaki’s Variable Front Differential Control by pulling a small control lever on the left handlebar. This is a definite advantage for traversing deep mud, slippery uphill trails or large objects such as logs or rocks. Using aluminum in the construction of the front exhaust pipe cover, two-piece center exhaust pipe cover, and the muffler cover helps keep the weight down. Other features designed to enhance the Brute Force 650 4x4i’s power-to-weight ratio include drilled gears to reduce transmission inertia and provide maximum acceleration. A well-engineered front A-arm layout provides ideal caster angle and delivers both light and responsive steering plus excellent terrain-following capabilities. The 650 4x4i shock spring rates and initial preload settings for the front and rear are set to deliver excellent ride comfort. Further ride enhancement comes from the plush and supportive urethane seat foam. Equipped with sturdy front and rear racks, the versatile 2017 Kawasaki Brute Force 650 4x4i ATV is a perfect fit on the farm as it can carry tools, equipment or feed. It shares front/rear racks, skid plate and head light cover with its larger Brute Force 750. Enhancing the high-performance brakes is the Kawasaki Engine Brake Control system, which electronically monitors ground speed and uses the engine’s compression to help slow the Brute Force 650 4x4i under certain conditions. This able ATV can pull a hefty 1,250 pounds, and can carry a combined 264 pounds on its front and rear racks. Owners can expand the versatility of their Brute Force 650 4x4i via an extensive line of Genuine Kawasaki Accessories, available through R W Brown - an authorised Kawasaki dealer. Kawasaki’s V-twin powered sport-utility all-terrain vehicle (ATV) family, the Brute Force 650 4x4i offers refined power and handling. It combines a plush ride courtesy of its competent front and rear independent suspension with a superb fourwheel drive system and a durable yet powerful 633cc V-twin engine.